Official Google Cloud Blog: Reimagining a Founding Father’s discoveries: What if Ben Franklin had gone Google? Reimagining a Founding Father’s discoveries: What if Ben Franklin had gone Google? Editor's note: We’re jumping into our Delorean to explore how some of our favorite historical figures might have worked with Google Apps. Today, on Independence Day, we imagine Benjamin Franklin’s research, discoveries and accomplishments if he had gone Google. Ben Franklin is often called “The First American.” He was an inventor, entrepreneur, diplomat and scientist, as well as a revolutionary Renaissance man. As true history nerds, we decided to celebrate Independence Day by commemorating our most inventive Founding Father. We asked ourselves: what if Ben Franklin had done some of his prolific work, solving some of life’s greatest quandaries using Google Apps? In drafting and editing the Declaration of Independence, we imagine he might have used the real-time editing features in Google Docs to collaborate with his fellow committee members, John Adams, Thomas Jefferson, Robert R. Livingston and Roger Sherman. Jefferson wrote most of the first draft and shared it with Franklin and Adams, who added their suggestions — an observer later described the draft as “scored and scratched like a school boy’s exercise.” Franklin could have kept the original intact by using suggested edits and adding comments about his concerns, particularly related to controversial passages that blamed the British people rather than King George III. Some of the most recognizable lines in the Declaration of Independence were influenced by other documents, namely the Constitution of Virginia and Virginia’s Declaration of Rights. But if while reviewing the new content Franklin needed to verify historical information — for instance, the laws obstructed by the King of Great Britain— he could have used the Research tool to get quick search results without leaving Docs. To collect all 56 signatures for the Declaration of Independence, Franklin and his peers might have used the DocuSign integration in Google Drive. Although most of the men signed on August 2, 1776, Elbridge Gerry, Oliver Wolcott, Lewis Morris, Thomas McKean and Matthew Thornton actually signed months later. With DocuSign, some of these men could have signed on the same day — Wolcott, for instance, was home in Connecticut due to poor health and missed the formal signing of the declaration. As Franklin was a frequent international traveler (he was the first United States Ambassador to France), Apps might have helped him stay in touch with friends and colleagues around the globe. For instance, before he became ambassador, Franklin was in Paris as Commissioner of Congress to the French Court. On the first anniversary of Independence Day in 1777, he hosted a party for expats — and imagine if he could have used Google Hangouts to bring his comrades in America to the celebration over video conference. He could've shared a virtual toast with George Washington, who gathered a group of patriots in New Jersey, and with revelers enjoying the first annual Fourth of July fireworks on the Philadelphia Commons. You might not know that Franklin also developed the concept of volunteer fire departments when he was living in Philadelphia. 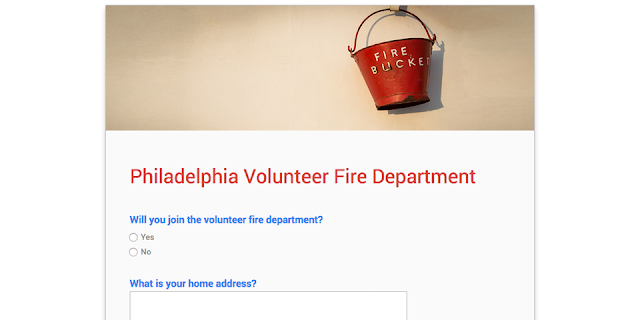 To make volunteering as convenient as possible, he could have asked volunteers to sign up with their home addresses in Google Forms, then used My Maps to lay out all those addresses and assign volunteers to their closest first department. Franklin appreciated written works, whether others’ or his own. In fact, he developed a lending library to promote equal access to books — a model that later became the public library system. He was also a prolific writer and author of the famous Poor Richard’s Almanack and taught himself French, Italian, Spanish, Latin and German. But he may have used Google Translate within Docs to help translate the Almanack to Slovene. He could have shared library books and his many writings on Drive without worrying about file size, as he’d have access to unlimited storage. He could also have used advanced search within Drive to find files by their type and owner. Fascinated by storms and electrical currents, Franklin famously discovered that lightning is a form of electricity and invented the lightning rod to protect people and homes from electrocution. He could have recorded his observations about the conductivity of different lengths and shapes of lightning rods using Sheets on his mobile phone, even if he had no Wi-Fi or data signal during a storm. Using offline mode, he’d be able to make updates that would sync as soon as he signed back online. To educate the public about his lightning rod invention, Franklin could have held town hall meetings and used Chromecast or Airplay to present with Google Slides. He might have used this platform to share his findings on electricity and help others understand his theories and new terms, including terms like “battery,” “charge” and “conductor” that we still use today. Franklin often looked to the future and sometimes regretted being born too soon. From inventing bifocals to mapping the Gulf Stream, he was certainly ahead of his time. On this Independence Day, we’re proud to celebrate Ben Franklin — a problem-solver who advocated for freedom and equality, and a polymath who promoted the kind of universal knowledge-sharing that inspires us here at Google in the future he helped shape.